Belcam Allure (Allie) is our movement machine. With a superb, soft, laid back temperament, she is a pleasure to have around. 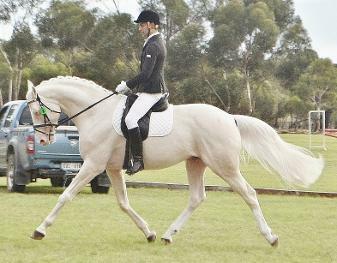 Belcam Allure was ACE assessed in 2010 as a foal, achieving an Elite Award and prized golden ribbon for 81.75% overall, with 85% for movement and 78% conformation. Allie ranked second overall in 2010 for all fillies, and had the highest score for movement of all horses assessed in 2010, all ages, including the stallions. Allure still ranks as the 8th highest ACE graded horse for movement, from 2007, up to and including the 2013 assessment year. 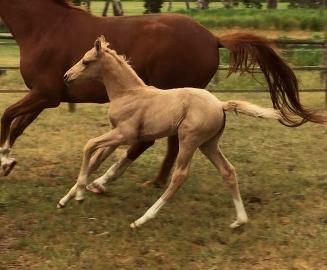 This ranking is for all foals, mares and stallions, both imported horses and Australian-bred. 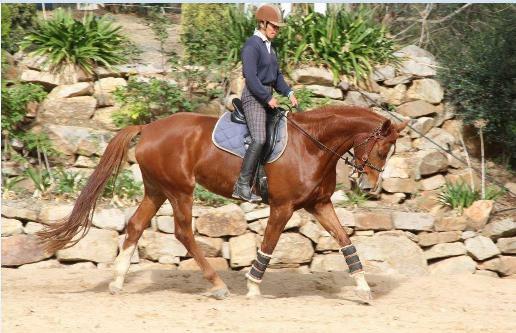 With both the famous Argentinus and Souvenir in her lines, Allure is likely to have dual purpose to perform exceptionally well herself, and breed both dressage prospects and sport horses most suitable for jumping. Added to that, from a dilute breeder's perspective, Allie has a flaxen mane and tail and cherry red coat colour - just perfect for producing palominos. 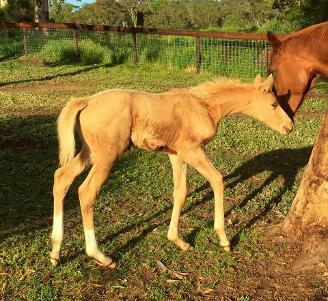 Allie's first foal, Skyview Sovereign, arrived on 8 October 2015. 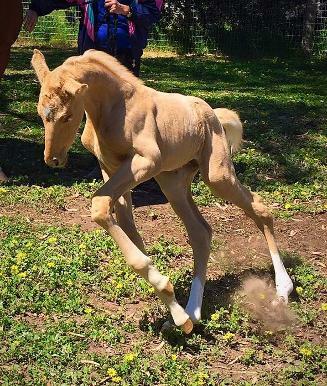 He is a stunning (to mature) 16.3h warmblood x heritage Australian Stock Horse colt, sold at 6 days of age to QLD, as a future performance and show horse, and stallion prospect. 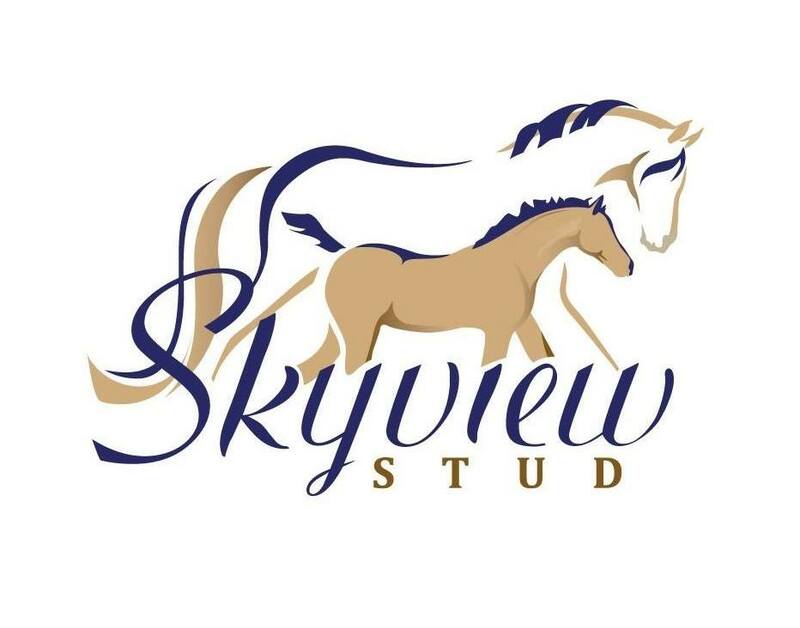 Skyview Stud is retaining breeding opportunity to this beautiful colt. 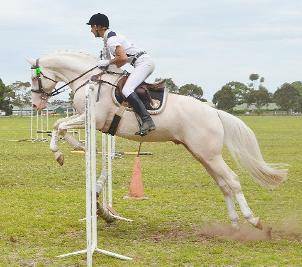 The cross to Goldmine Mirage-HSH is exactly the reason we purchased Allure as a 7 month old from Belcam Stud in QLD. We are extremely happy with the outcome. 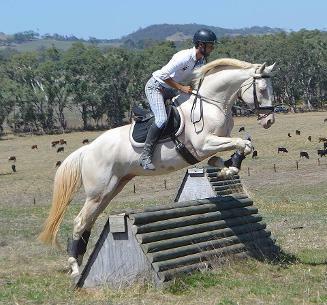 We will be repeating the mating to Goldmine Mirage-HSH in spring 2016, for another golden warmblood x Australian Stock Horse foal in spring 2017. 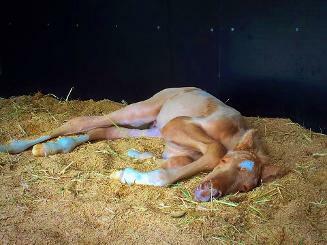 If you are potentially interested in this foal, please register your interest with us. Goldmine Mirage-HSH, sire of Belcam Allure's 2015 colt and 2017 future foal. Show, dressage, jumping or eventing ..
Today we went and picked Allie up from her breaking in. This is Linda O'Leary riding her as a green breaker (4 weeks after first having a rider on her back) and after Jed Marshall under John O'Leary's tutelage broke her in. She''ll now be turned out until Spring 2014. 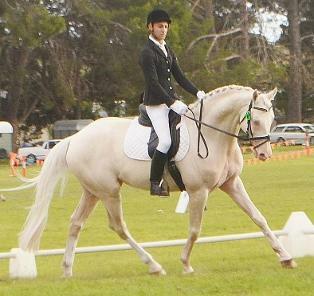 Belcam Allure is currently 5 years old, and an Elite ACE graded Australian Warmblood mare, receiving a score of 85% for movement from the international assessor and notoriously tough marker, Gerd Kuest. This included a 9 for walk, 8.5 for trot, 9 for canter and 9 for swing / elasticity. 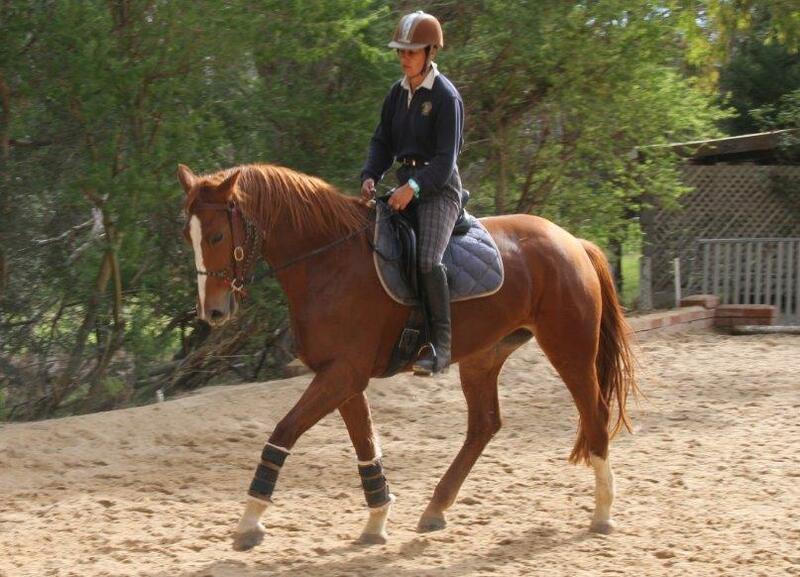 She currently around 16.2h, and we purchased her from Belcam Stud as a 7 month old as a future broodmare. She is a double cross of Argentinus (HAN) with Souvenir (TB) as her great grandfather. Allie's breaking in was delayed by a year due to a very serious injury in March 2013, when she was 3 years of age. John O'Leary "test driving" Allie to see how she's progressing. 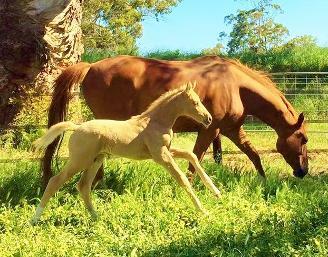 Video of Belcam Allure at around 3 weeks of age, at the ACE classifications in January 2010.